I’m recently back from another memorable family vacation in Barbados – such fun for all ages of family members who gathered together at Coral Reef – and was delighted by the arrival of a special package I had arranged to be delivered upon my return home. It’s another piece of one-of-a-kind dinnerware that Charlie and I have been collecting from Earthworks – No Ordinary Pottery!, one of my musts whenever I’m on the island. For the lovers of pottery among you – or your clients – I urge you to stop by David Spieler’s production shop in St. Thomas, where you may tour the work area free of charge and watch the potters at their craft. Originally founded by David’s mother, Goldie Spieler, in 1983, the then-small art studio produced “one-off” whimsical clay works. Today, they are recognized worldwide for their quality and innovative design, as well as their original form of embellishment. They carry fully functional lines of dinnerware and serving pieces in over 150 shapes and 36 patterns, making collecting such fun. We have round, square, rectangular and oval pieces of these red clay ceramic pieces, serving the dual purpose of dinnerware and dinner conversation! In recent years, in addition to the off-the-shelf dinnerware in dozens of patterns, Earthworks has been striving to make each piece an individual, highly ornate piece of art – following in the footsteps of Clarice Cliff’s “Bizarre Pottery” lines, by which they are immensely inspired. This comes in response to the number of repeat collectors, who, while having amassed the more traditional pieces, are still smitten with the Earthworks style and are looking for something newer. As you watch the artists at work and chat with them about the pieces they make, it’s nearly impossible not to be tempted to purchase a piece (or many), which can be delivered to your accommodations or shipped home, as I arranged for. In addition to the tableware, there are platters, coasters, bowls in all shapes and sizes, vases, lamps, desk and bathroom accessories and fantastical wall mosaics. Feel free to get creative and ask for a house name or number sign, splash tiles or accent tiles for your kitchen or bathroom – Earthworks potters are always delighted to have a new challenge. Each piece is hand-finished and hand-decorated, as well as lead-free and food-, microwave- and dishwasher-safe. Intrigued? 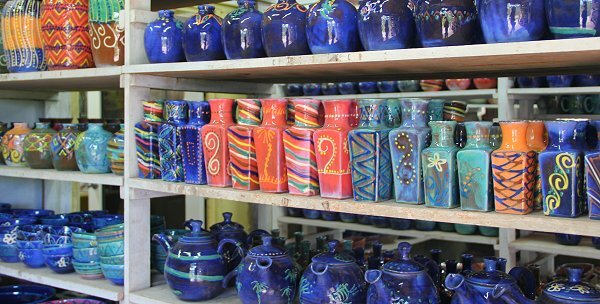 Visit Earthworks Pottery’s website and “ooh” and “aah” over pieces you may pick up during your next Barbados visit. I promise you’ll cherish your selections for a long time to come.